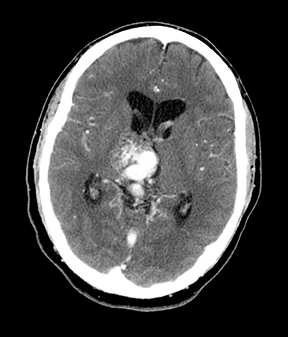 A 22-year-old male presents to the emergency department with headache and vomiting. 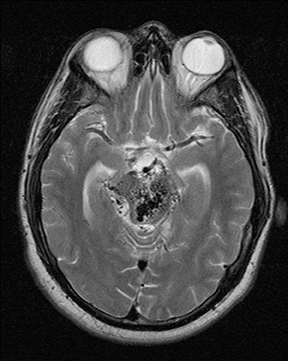 Two days prior to evaluation, the patient had a sudden onset of occipital headache, which resolved later the same day. There are multiple abnormal enhancing vessels centered in the midbrain, right thalamus, third and lateral ventricles (Figures 1-4) compatible with arteriovenous malformation. Associated venous varices extend into the lateral ventricles (Figures 1-3 and 5). Dominant arterial supply is via the posterior cerebral arteries and distal branches of the basilar artery (Figures 4, 6, and 7). Primary drainage is through ectatic internal cerebral veins, the vein of Galen, and, ultimately, the straight sinus (Figure 6). 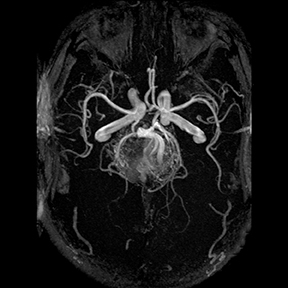 Arteriovenous malformations (AVM) are the most common symptomatic cerebral vascular malformation and generally present between the second and fourth decades of life.1 An AVM is a direct vascular communication between the arterial and venous systems via a tangle of abnormal vessels called a nidus. 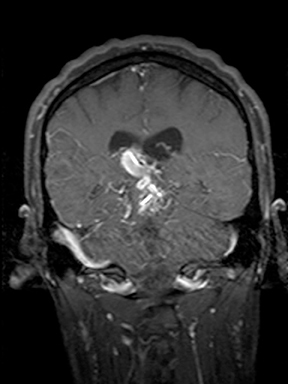 No brain parenchyma is found within the nidus.Classically, AVMs are wedge-shaped with the apex directed toward the ventricle and the base along the cortex with enlarged feeding arteries and draining veins, but no associated edema.2 More than 80% are supratentorial (particularly, parietal in location) and the majority are solitary.3 Multiple AVM are associated with Rendu-Osler-Weber syndrome and Wyburn-Mason syndrome. Normal arterioles and capillaries are not present and this produces a low-resistence/high-flow lesion which is prone to hemorrhage. 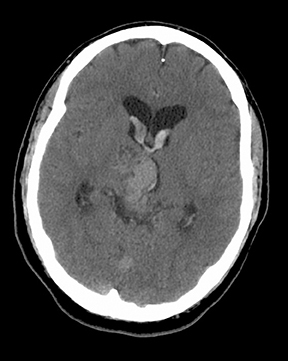 Rate of hemorrhage is approximately 2% to 4% per year4 and risk of hemorrhage is increased by several factors: intranidal aneurysm, high intranidal pressure from either increased pressure in feeding arteries or restricted outflow in the venous drainage and deep location(characterized by: periventricular/intraventricular or basal ganglian AVMs, central venous drainage, arterial supply from the vertebrobasilar system or perforating arteries).5 A 10% to 15% mortality rate is associated with each hemorrhagic event, and permanent neurologic deficit associated with hemorrhage is twice the risk of death, about 20% to 30% per event. AVM-associated neurologic deficit can occur in the absence of hemorrhage and is a significant factor in morbidity and mortality.6 Another common clinical manifestation of AVMs is seizure, particularly for large lesions and those located in the temporal and frontal regions. The goal of therapy is complete obliteration of the nidus and this may be attempted by surgical excision, intravascular embolotherapy or radiotherapy depending on the characteristics of the AVM and operative risk.9 Conventional catheter angiography is superior to MR in identifying specific arterial supply and venous drainage of the AVM, but MR is more accurate than CT or angiography in determining nidus size and degree of nidus obliteration post embolotherapy.10 Surgery is most successful in smaller more superficial lesions. If theAVM is deep within the brain parenchyma and/or the operative risk is high and the lesion is < 3.5 cm, stereotactic external beam radiation is used. Intravascular embolization is used preradiotherapy to shrink large lesions and before surgical excision to eliminate deep feeding arteries. A combined therapeutic approach tailored to the specific characteristics of each AVM has been the most successful. Intracranial hemorrhage in the absence of tumor should prompt investigation for AVM. Risk of morbidity and mortality is high in AVMs even without hemorrhage. Conventional catheter angiography remains superior to MR in delineating specific arterial supply and venous drainage of the AVM, but MR is more accurate than CT or angiography in determining nidus size and degree of nidus obliteration post embolotherapy. The goal of therapy is complete obliteration of the nidus for cure. Wilkins RH. Vascular malformations. Neurosurgery. New York: McGraw-Hill, 1985: 1448-1473. Burger PC. Vascular tumors and tumor-like lesions. Tumors of the central nervous system. Washington, DC: Armed Forces Institutes of Pathology, 1994:287-299. Castillo MD. Vascular malformations. Neuroradiology Companion, 2nd Ed. Philadelphia: Lippincott Williams and Wilkins, 1999: 97. Heros RC, Korosue K. Arteriovenous malformation of the brain. Curr Opinion Neurol Neurosurg. 1990;3:63-67. Fleetwood IG, Marcellus ML, Levy RP et al. Deep arteriovenous malformations of the basal ganglia and thalamus: Natural history. J Neurosurg. 2003;98(4):747-750. Anderson EB, Petersen J, Mortensen EL, Udesen H. Conservatively treated patients with cerebral arteriovenous malformation: Mental and physical outcome. J Neurol Neurosurg Psychiatry. 1988; 51:1208-1212. Atlas SW [ed]. Intracranial vascular malformations and aneurysms. Magnetic Resonance Imaging of the Brain and Spine, 3rd Ed. Philadelphia: Lippincott Williams and Wilkins, 2002: 840. Spetzler RF, Martin NA. A proposed grading system for intracranial arteriovenous malformations. J Neurosurg. 1986; 65: 476-483. Söderman M, Andersson T, Karlsson B, et al. Management of patients with brain arteriovenous malformations. Eur J Radiol. 2003:46(3):195-205. Smith HJ, Strother CM, Kikuchi Y, et al. 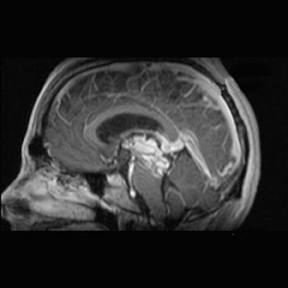 MR imaging in the management of supratentorial intracranial AVMs. Am J Roetgenol. 1988;150(5):1143-1153. Intraventricular hemorrhage secondary to arterial venous malformation. Appl Radiol. Prepared by Dr. Fitzwater and Dr. Snowden while at the Department of Radiology, Baptist Integris Health Center, Oklahoma City, OK.